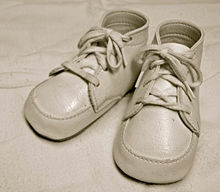 A 6-word story regarding a pair of baby shoes is considered an extreme example of flash fiction. "For sale: baby shoes, never worn." is the entirety of what has been described as a six-word story, making it an extreme example of what is called flash fiction or sudden fiction. Although it is often attributed to Ernest Hemingway, the link to him is unsubstantiated and similar stories predate him. This May 16, 1910 article from The Spokane Press recounts an earlier advertisement which struck the author as particularly tragic. 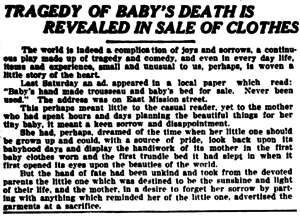 The May 16, 1910, edition of The Spokane Press had an article titled "Tragedy of Baby's Death is Revealed in Sale of Clothes." At that time, Hemingway would only have been aged ten, and years away from beginning his writing career. In 1917, William R. Kane published a piece in a periodical called The Editor where he outlined the basic idea of a grief-stricken woman who had lost her baby and even suggested the title of Little Shoes, Never Worn. In his version of the story, the shoes are being given away rather than sold. He suggests that this would provide some measure of solace for the seller, as it would mean that another baby would at least benefit directly. By 1921, the story was already being parodied: the July issue of Judge that year published a version that used a baby carriage instead of shoes; there, however, the narrator described contacting the seller to offer condolences, only to be told that the sale was due to the birth of twins rather than of a single child. The earliest known connection to Hemingway was in 1991, thirty years after the author's death. This attribution was in a book by Peter Miller called Get Published! Get Produced! : A Literary Agent's Tips on How to Sell Your Writing. He said he was told the story by a "well-established newspaper syndicator" in 1974. In 1992, John Robert Colombo printed a letter from Arthur C. Clarke that repeated the story, complete with Hemingway having won $10 each from fellow writers. This connection to Hemingway was reinforced by a one-man play called Papa by John deGroot, which debuted in 1996. Set during a Life magazine photo session in 1959, deGroot has the character utter the phrase as a means of illustrating Hemingway's brevity. In Playbill, deGroot defended his portrayal of Hemingway by saying, "Everything in the play is based on events as described by Ernest Hemingway, or those who knew him well. Whether or not these things actually happened is something we'll never know truly. But Hemingway and many others claimed they did." The general concept of trying to tell a story with the absolute minimum of words became known by the general term of flash fiction. The six-word limit in particular has spawned the concept of Six-Word Memoirs, including a collection published in book form in 2008 by Smith Magazine, and two sequels published in 2009. ^ a b c d e f g Garson O'Toole (January 28, 2013). "For Sale, Baby Shoes, Never Worn". quoteinvestigator.com. Retrieved 19 April 2013. ^ a b Haglund, David (Jan 31, 2013). "Did Hemingway Really Write His Famous Six-Word Story?". Slate. Retrieved 14 April 2013. ^ Kane, William R. (February 24, 1917). "untitled". The Editor: The Journal of Information for Literary Workers, Volume 45, number 4. pp. 175–176. Retrieved 20 April 2013. ^ Miller, Peter (Mar 1, 1991). Get Published! Get Produced! : A Literary Agent's Tips on How to Sell Your Writing. SP Books. p. 27. ^ Mikkelson, David; Mikkelson, Barbara (29 October 2008). "Baby Shoes". Snopes.com. Retrieved 14 April 2013. ^ "Six-Word Memoirs Can Say It All". CBS News. February 11, 2009. Retrieved 20 April 2013. This page was last edited on 12 December 2018, at 04:58 (UTC).